Archive "Basketball Vertical Jump Drills"
These vertical jump workouts are designed to help players jump higher, jump faster, and be more explosive on the floor. All of these actions translate into the game of basketball and different skills involved with playing. Whether it is rebounding the basketball, contesting a shot, or finishing at the basket having an increased vertical and explosiveness will help. You still need to learn and use the fundamentals for these skills, but all of these skills can be made better by improving your vertical jump. These vertical jump workouts are all in high-quality video and text format. They are also instructed by basketball trainers and then demonstrated by high-level basketball players as well. This will allow you as a player or basketball coach to really learn the proper technique for the workout and that will help to maximize the player development and vertical training. 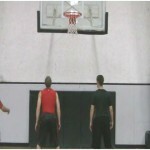 There are several different basketball training tools that can really help with improving a player’s vertical as well. So after you check out these different workouts, check out our list of the best basketball training equipment to find the right training tools to work on improving a players vertical. If you want your team to be able to more athletic on the defensive end and get into passing lanes and contest shots you first need to teach them the correct way to cut off angles, how to line up a shot when contesting it, etc. However, if your team is not very athletic or explosive on defense it isn’t going to work very well. This is just one example, but it shows the need for working on your team’s vertical jump and explosiveness in your basketball training time. Teach your team to be quick off their feet and ready to anticipate where the ball is going to go with these basketball training videos. Being able to jump and be explosive is becoming almost a must in the game of basketball today. Players are becoming more and more athletic, and if you are not working on becoming more athletic yourself, then you are going to fall behind. These vertical jump workouts will help you work on being able to jump higher, jump quicker, and have multiple quick jumps in a row. You don’t need to spend hours a week working on your jumping either, but I would recommend about 20 minutes 2-3 times a week. When you do the exercises make sure that you are really locking in and focusing on form. Jumping has a lot to do with technique and using the correct form. 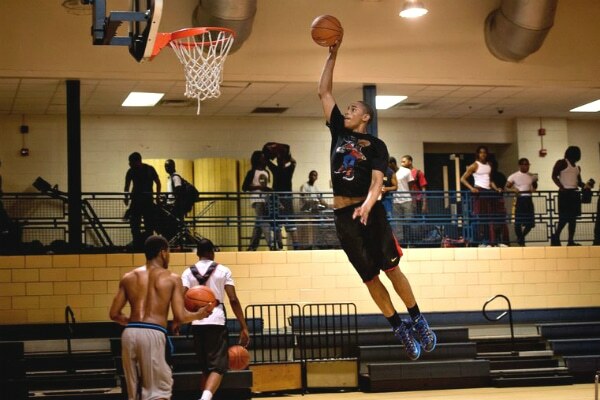 Here is a great article on learning how to increase your vertical. Sign up for a Pro Membership plan now and receive a free 7 day trial. This will give you full access to the site as well as all of these vertical jump workouts. This bounding workout is going to develop the players single leg jumping ability and also their speed. Box jumps are great because they give the athlete something to see and lets them know how high they need to jump each time. The bunny hops workout is going to help the player work on strengthening the lower half of their legs and also their jumping quickness. The frog jumps workout is really going to help the player work on loading before they jump, and also the correct jumping technique and form. This quick hops exercise is going to use a small platform and is going to work on the players ability to jump quickly multiple times in a row. The staggered stance squat jumps workout is going to teach the player to be able to jump when their feet aren't completely lined up. This standing broad jumps exercise is going to teach the player to be explosive and work on jumping higher and quicker. 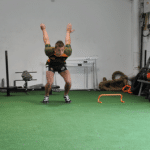 This squat jumps exercise is going to add some twists and rotations into it to make it a little more difficult and challenging for the player. This backboard touches drill is going to help the player work on their ability to quickly jump multiple times in a row. Depth jumps are a plyometric drill that uses your bodies moment against you and causes your muscles to work harder then they normally would. The dot drill is going to help the player work on foot coordination, quickness, and vertical jump all at the same time. The basketball dunk drill is designed to help you work on your vertical jump as well as being able to jump quickly off the ground multiple times in a row. This lunge jumps drill is going to help the player develop a strong jumping foundation and teach them to be explosive. The hurdle drill is going to work on the players ability to quickly jump in any direction. Whether it is forward, backwards, or side to side. Knee tucks are going to work on the players jumping ability, but it is also going to work on their fast twitch muscles and their ability to quickly jump. This lateral cone hops drill is going to teach the player how to laterally jump higher, quicker, and be more explosive. The lateral squat jumps exercise is going to help the player work on their vertical as well as opening up the hips and core area. Lunge jumps are a great way to strengthen your legs, but also work on opening up the hips and becoming a more explosive leaper. Pogo jumps are going to work on developing strength and quickness in the lower half of the players legs. The goal of single leg broad jumps drill is to strengthen each leg individually, and to promote maximum leaping ability. The single leg hops drill is going to help the player work on jumping quickly multiple times in a row, as well as develop the overall vertical. Single leg squat jumps are going to isolate each leg and really focus on developing that legs jumping ability and strength. This depth jumps exercise is going to have varying heights of boxes and is going to have the player alternate between which box they jump one. Reaction depth jumps are going to train the player to quickly be able to jump off two feet in any direction, and also to think while doing the drill. The standing triple jump drill is going to work on developing both legs individually and together.